Walking is an endurance activity and you will need to replace energy fuel when walking for two hours or more. Energy bars, energy gels, and sports drinks can replenish you. These are things to take along on for eating while walking. But you should also think about what to eat before a morning walk and what to have as a recovery drink or snack. Energy bars have a mix of carbohydrate, protein, and fat.​ They are convenient for a snack when on a long walk, especially as a meal replacement. Most rely on either peanuts or soy for protein, with the soy ones targeted to women. The "outdoor" types generally are not chocolate covered and hold up better in your pack. Some of the original types really gave your jaws a workout to chew. Nutrition bars are intended as meal replacements, providing vitamins and minerals and often having more calories and protein. Take along fruit for the truly all-natural carbohydrate burst. Bananas are an excellent source of potassium. Apples, small oranges, and raisins are great packable snacks. Be sure to dispose of peels and cores appropriately—in the trash, not just tossed in the bushes. The drawback is that the high fiber in apples and raisins may get you, er, moving. Some people may have stomach upset from various types of fruit. 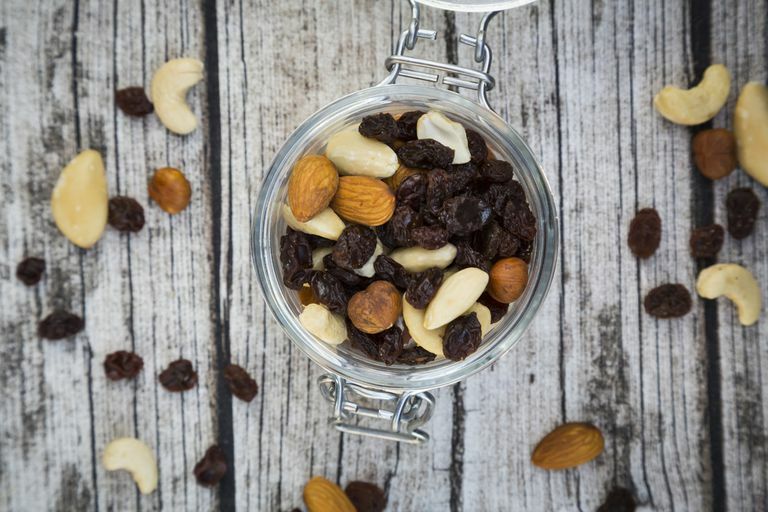 Trail mix is the original energy bar, with less melting. You can mix it up yourself or buy it in bulk or packaged. Generally, it contains nuts for protein, raisins or other dried fruit for carbohydrates, and often chocolate or carob for taste. It has salt to replace electrolytes. Use portion control, as trail mix is often high in fat and calories—about 140 calories and 9 grams of fat per ounce. Energy gels provide a carbohydrate blast designed especially for those on endurance events such as marathons. If you walk fast and breathe hard, a gel pack is safer than chewing/choking. Energy gels must be taken with water. New brands aim at being natural or being less cloyingly sweet than the original brands.